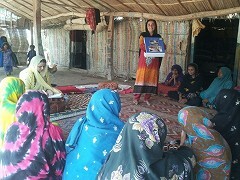 Pakistan Home Health Education Program started in June 2014 with the goal of promoting health in one rural area of Pakistan by disseminating health-realted knowledge including polio to premarital women. The progam targets premarital women with the expectation that they will communicate with their family members and neighbors what they learned to share their health knowledge, and they will have needed health knowledge by the time they have their own family. 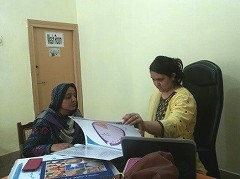 In September 2013, AMDA did the first preliminary interview survey on polio eradication activities in Pakistan. In January 2014, AMDA, Chigasaki Chuo Rotary Club (CCRC) and National Rural Support Programme (NRSP) collaboratively conducted the second preliminary interview survey. Those surveys showed the need for health education including knowledge on Polio, especially among women who play a main role in health management of their family. 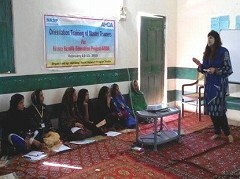 Therefore, AMDA and CCRC along with local implementing partner, NRSP, started “Pakistan Home Health Education Program” for premarital women residing in a rural area where they rarely have a chance to take health education classes which are easily available in Japan or other developed countries. From the inauguration ceremony held in Chigasaki in June 2014 to February 2015, it was the preparation period before offering classes to premarital women. Namely, NRSP conducted a bassline survey in order to collect information on the level of health knowledge among the women where the program is implemented. Based on the result from the survey, textbooks for both lecturers and premarital women were developed. At the same time, selection of lecturers to teach and registration of premarital women to participate in the program were started. For viewing Baseline Survey Report, please click here. During preparation period a few problems surfaced. For example, number of pre-marital women residing in the program implementing areas, were not enough to achieve the target number. For this matter, the program implementing areas were expanded to its adjacent areas, based on the result from the first year. Also, without using knowledge, lectures could lose what they learned in their training course as time goes by. Therefore, the arrangement was made to provide all 21 lecturers the opportunity to teach classes within 4 months from their training. An original plan was that 4 lectures teach 2 groups (total of 40 premarital women) each month. However, under a new plan, 6 lectures will teach 3 groups (total of 60 premarital women) per month for the first three months out of 36 months. Besides that, we found the need to follow up pre-marital women who participated in the classes in order to evaluate their health-related behavioral changes. AMDA, CCRC and NRSP will work together to develop an evaluation sheet and NRSP will make follow-up visits to each house of participated premarital women every three months. Since the class started in March 2015, 6 groups of 124 premarital women were educated under this program. As of May 2015, 104 of them passed the post-test. AMDA, CCRC and NRSP will continue to work together for this program and 1440 premarital women will receive health education. For viewing Annual Report received from NRSP: Please click here.